30% off a 90 point Gold Medal Winner! Indie Winemakers Sale -$16.80 plus shipping fees. This exceptional wine comes from the Oak Knoll District of Napa Valley. A perfect wine to share during the Hanukah-Chanukah-Januca-Hanukkah Holidays! 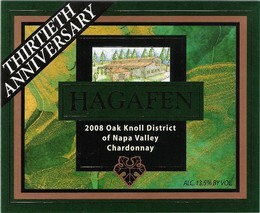 With its light sunflower hue and green apple, guava, and kiwi bouquet, Hagafen’s newest Chardonnay presents an integrated, melodious blending of bright apple, apricot, and pineapple, with a kiss of toasty oak. With one hundred percent malo-lactic fermentation yet light on the palete. Sight: This wine is clear with a Light straw yellow hue. Some teardrops with no color variation. Aromatics: Fruity with green apple, slightly floral and a slight butter, butterscotch, and oak aroma. Palate: Very smooth soft mouthfeel, light to medium body with some richness; balanced. Nice wine that shows the youthful tendency toward freshness and simplicity; should gain complexity and harmony in a few months. We suggest you pair the 2008 Napa Valley Chardonnay with Hanukah Latkes-and-Applesauce. This is the first time Ketcham Estates has offered their wine outside of their mailing list allocations, and we are proud to offer it for a limited, one-time only sale. Michael Browne, (Wine Spectator has anointed him, ‘The Prince of Pinot’) from the famed Kosta Browne winery is the winemaker for this wine. Perfect for food pairings during the holidays, this wine will also make a special gift. Sight: This wine is clear, dark ruby red in color with a slight strawberry color rim variation. Big, slow teardrops with no color. Aromatics: Light red fruits such as strawberry and raspberry. Palate: Smooth and medium round texture. Fresh red fruit flavors of strawberry, raspberry with a bit or cedar and Dutch cocoa. We suggest you pair the 2007 Pinot Noir with Coq au Vin.